Market signals indicate that we have reached a peak in the rate of increase in both economic growth and earnings. Corporate earnings are expected to keep rising in 2019, but at a slower pace, and the same is true of GDP growth. It is harder to make predictions about 2020, but our main scenario is a continued slowdown in economic expansion, without being hit by a recession. After October's stock market slide, we again boosted the risk in our portfolios from a neutral position to a slight overweight in equities. This is primarily due to the combination of continued good growth and more attractive valuations. "We still have a cautiously optimistic fundamental outlook, but since we are in the latter part of the economic cycle it is reasonable to expect higher volatility. Uncertainty always increases in the late phase of the cycle, and 2018 has been a good example of this. Economic expansion and earnings have been strong, but risk appetite and returns have been weak. The market is still sensitive to disappointments, and we are prepared for sharp fluctuations in investors' willingness to take risks," says Fredrik Öberg, Chief Investment Officer, SEB Private Banking. This quarter's Investment Outlook report includes two interesting theme articles - on sustainable growth and on digital trends in East Asia. Starting with this issue, we are transitioning to providing you with a completely digital publication. All related materials can be found on seb.se/investmentoutlookreport. 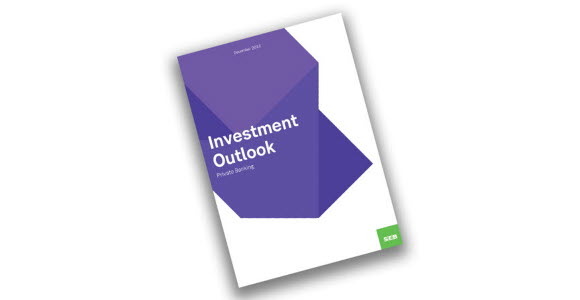 Investment Outlook can also be read in its entirety at www.sebgroup.com.